SWaCH is a collective of self-employed waste pickers that provides waste collection and management services. It publishes a quarterly newsletter. The latest has a lot of great articles! Included is an article about SWaCH and KKPKP waste pickers making their demands known to state government officials last month. They demanded registration of waste pickers as workers, livelihood protection and education for waste pickers’ children. Members spoke out eloquently about their struggle and demands. 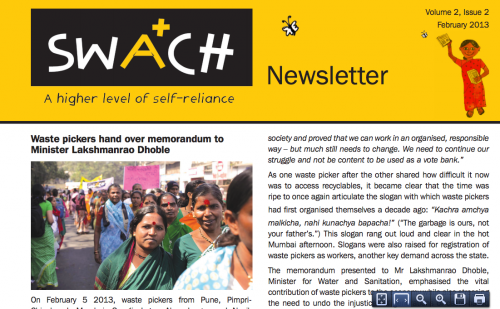 In another article, SWaCH gives an update on the fight against the privatization of waste management in Pune and discusses why weight based systems — such as the one a private contractor there is using — don’t work. The weight-based system could even discourage citizens from recycling! In other news, SWaCH will be launching a school program on waste generation, which aims to make school children more aware about waste, the people behind it, and how it affects the environment. Also included is the moving biography of a proud SWaCH waste picker, and a list of trainings and workshops, including one about India’s Right to Education, a law that gives disadvantaged children access to education. This is just a summary! Check out the complete newsletter! Comments Off on The SWaCH Newsletter is out!